For my father's birthday this week I asked him what he'd like me to make, expecting him to pick his favorite carrot cake. Then I remembered that I had my Iron Cupcake Earth cupcakes to make and so I gave him the option of a chili pepper cupcake. I hadn't decided exactly what to make yet and his mind immediately sprang to one of his favorite dishes, Cincinnati Chili. The spices that accompany the chile powder in this regional favorite are cinnamon, allspice and CHOCOLATE. Perfect flavors for a cupcake! Since a good cupcake is only as good as it looks I also thought about the iconic look of Cincinnati chili. 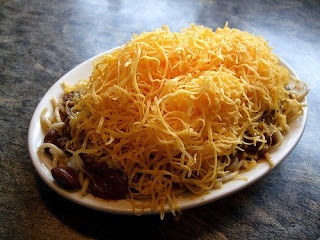 A bowl of Cincinnati style chili is topped with copious amounts of spaghetti and cheese. I knew I could pipe vanilla icing and grate orange-colored white chocolate for a whimsical "spaghetti and cheese" decoration. We ate the cupcakes today and they were wonderful. The spices in the cake reminded me of rich, chocolaty gingerbread. The sweet frosting brought out the chocolate taste even more and I loved the way the cupcakes looked. Alex had fun helping me pipe on the "spaghetti" and grate the "cheese". It was a fun project, a successful cupcake experiment and I think my dad really liked them. Thanks to Laughing Squid for the photo! This is my Iron Cupcake Earth: Chili Powder entry. You can vote for the best cupcake on Sunday, August 31st at NO ONE PUTS CUPCAKEIN A CORNER. Voting ends Thursday, September 4 at 12 noon. This month's prizes are a one-of-a-kind piece of original Cakespy art by ETSY artist Jessie Oleson; a luxury hostess apron from Jessie Steele; the next generation of the Cupcake Courier; and a new publication from the library of Taste of Home Books. *Be sure to check for other ingredients in spice jars labelled "chili powder". You want to buy pure chile powder and not anything with cumin, onion, garlic, etc added. -Preheat oven to 350 degrees F and line a cupcake pan with papers. -Add the flour, sugar, cocoa, baking soda, salt and spices to a large bowl. Stir with a wire whisk until full incorporated. Add the chocolate chips and stir to distribute. -Mix together the oil, vanilla, vinegar and water in a small bowl. Add the wet ingredients to the dry ingredients and stir until combined. Fill the cupcake papers three quarters full. -Bake for 20-25 minutes until a toothpick inserted into the center of a cupcake comes out with only a few crumbs clinging. -Cool for 5-10 minutes and then transfer the cupcakes to a wire rack to finish cooling. -Beat the margarine and shortening until smooth. -Slowly sift in the powdered sugar and beat until light and fluffy. -Add the vanilla extract and beat until mixed in. -Fill a piping bag with a #4 Wilton tip or snip a very small opening to create the "spaghetti". I made the orange "cheese" with orange colored white chocolate. I get dairy-free white chocolate from Chocolate Emporium. I melted the chocolate chips carefully in the microwave and then added both Wilton Lemon Yellow and Orange icing colors to get the ideal orange shade. I chilled the colored block of chocolate in the freezer. When I was ready to decorate, I microwaved the block of chocolate in 5 second increments to get it just warm and pliable enough to grate.